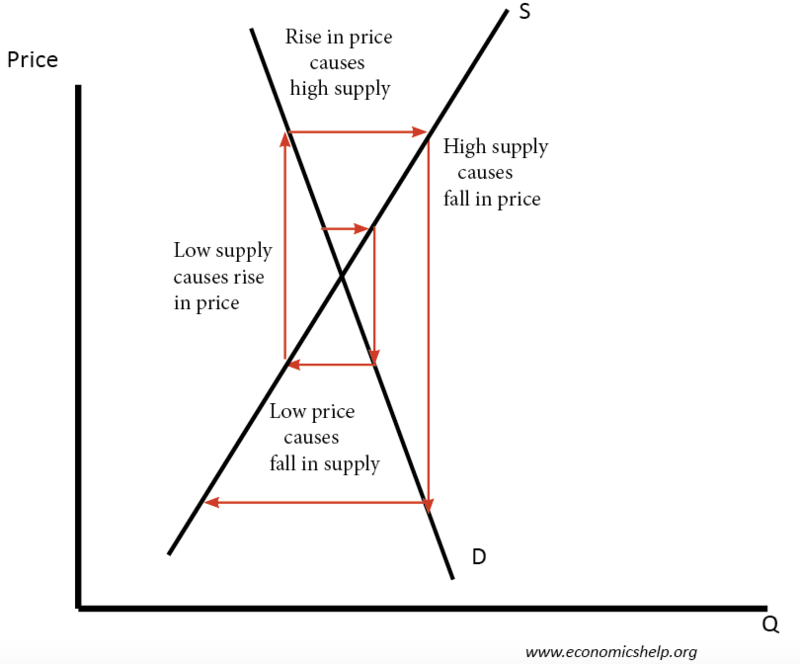 Cobweb theory is the idea that price fluctuations can lead to fluctuations in supply which cause a cycle of rising and falling prices. 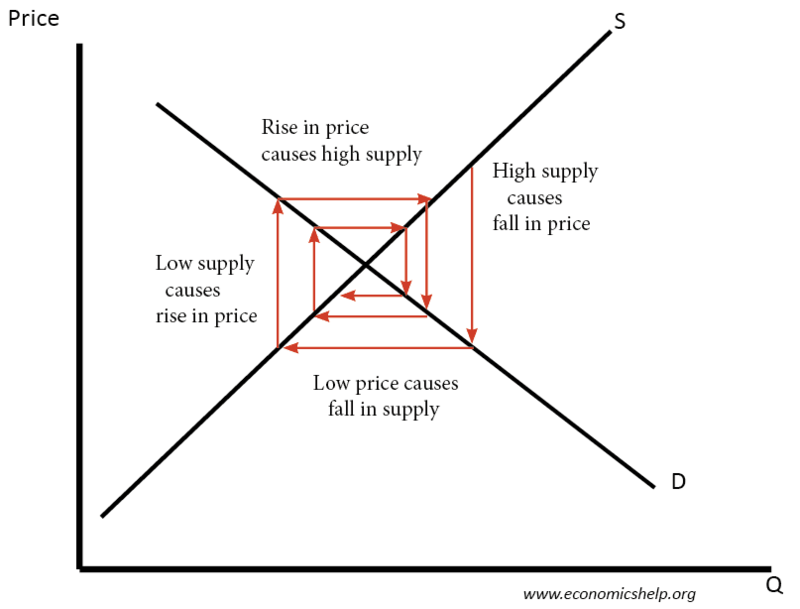 In a simple cobweb model, we assume there is an agricultural market where supply can vary due to variable factors, such as the weather. A key determinant of supply will be the price from the previous year. A low price will mean some farmers go out of business. Also, a low price will discourage farmers from growing that crop in the next year. If there is a very good harvest, then supply will be greater than expected and this will cause a fall in price. However, this fall in price may cause some farmers to go out of business. Next year farmers may be put off by the low price and produce something else. The consequence is that if we have one year of low prices, next year farmers reduce the supply. If supply is reduced, then this will cause the price to rise. If farmers see high prices (and high profits), then next year they are inclined to increase supply because that product is more profitable. In theory, the market could fluctuate between high price and low price as suppliers respond to past prices. 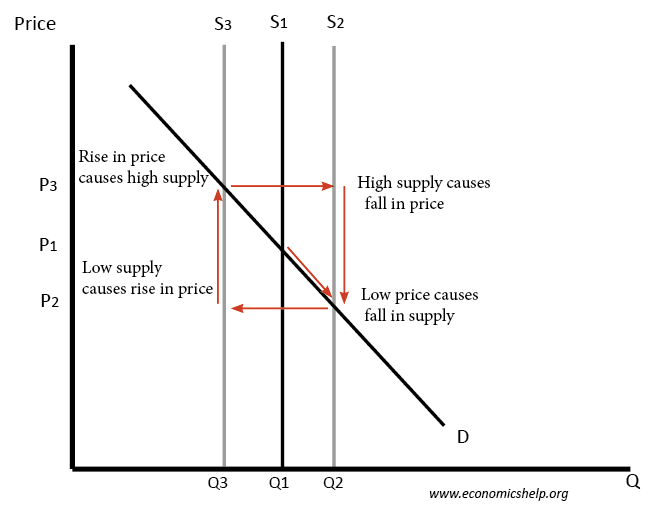 If the slope of the supply curve is less than the demand curve, then the price changes could become magnified and the market more unstable. Rational expectations. The model assumes farmers base next years supply purely on the previous price and assume that next year’s price will be the same as last year (adaptive expectations). However, that rarely applies in the real world. Farmers are more likely to see it as a ‘good’ year or ‘bad year and learn from price volatility. Price divergence is unrealistic and not empirically seen. The idea that farmers only base supply on last year’s price means, in theory, prices could increasingly diverge, but farmers would learn from this and pre-empt changes in price. It may not be easy or desirable to switch supply. A potato grower may concentrate on potatoes because that is his speciality. It is not easy to give up potatoes and take to aubergines. Other factors affecting price. There are many other factors affecting price than a farmers decision to supply. In global markets, supply fluctuations will be minimized by the role of importing from abroad. Also, demand may vary. Also, supply can vary due to weather factors. Housing is very inelastic and subject to booms and bust. In response to the housing boom in Ireland, supply increased. But, the price collapsed, leading to big fall in the building of new housing. Tamari, (1981) argued there was evidence of cobweb nature of the Israeli housing market. Authors: Gene A. Futrell, ; Allan G. Mueller; Glenn Grimes. 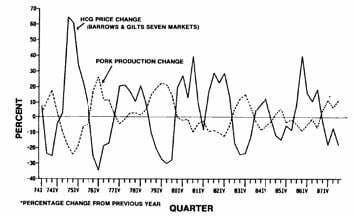 Why are prices volatile in agricultural markets?